Simplify your battery charger installation with BHS Charger Power Modules. 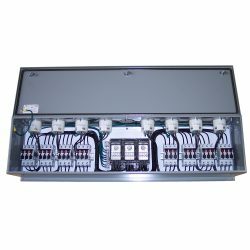 Charger Power Modules are designed to be directly wired into your warehouse’s main power distribution panel with a single 3-phase, 480-volt connection. These power modules can accommodate four, six, or eight chargers per panel and can be mounted directly to any of BHS’s wide array of Battery and Charger Stands. Once installed, chargers can be easily connected and disconnected via twist-lock plugs*. This way, battery room operators can remove, replace, or add chargers without rewiring. In addition to this benefit, the Charger Battery Module reduces the volume of exposed electrical wiring in your battery room. The slender design also allows you to make the most of your battery or charger stand space. To learn more about making your battery room more efficient by adding Charger Power Modules to your warehouse’s Battery or Charger Stands, call our sales team at 1.800.BHS.9500. *Note: Never connect or disconnect plug receptacle if charger is under load. Switch rated, class CC fused type circuit protection device. The switch is rated for disconnecting applications under load. The class CC fuses allow for a short circuit current rating (SCCR) of 100 kA when incoming power lines are properly fused.